Here are ten motorhome questions by motorhome owners who’d like to know about renting and using a motorhome in the UK. Take a read! 1. I haven’t driven a motorhome before, but I’m excited to rent one. How do beginners go about it? Camperbug.com advises beginners to search for a motorhome club in the region of residence. Many clubs conduct courses that train the driver how to manoeuvre a large vehicle on the road plus include defensive driving and instructor feedback as well. 2. I’m confused! What type of motorhome should I rent? It’s best to conduct ample research, as there are numerous models with different features and come in a variety of sizes. A motorhome is generally a panel van or car conversion, constructed on a commercial chassis and comes excluding or including a driving cab like A-class motorhomes. Take into consideration your needs, travel route and required facilities before you reserve a motorhome. 3. Is it easy to drive a motorhome? Motorhomes are very much like cars and are relatively easy to drive. The bulk of the vehicle, however, makes driving in small or tight corners a tricky manoeuvre. A bit of practice and help from reversing camera will do away with driving insecurities. 4. What tire care system would you recommend for a motorhome? The best time to change a tire is after five years of use. Exceed seven years of use, and your tires will be severely deteriorated making it unsafe for you and other motorists. If you’re storing a motorhome away for the winter months, remove the tires and wheels and save them away in a cool, dry location devoid of direct sunlight. Periodically moving a motorhome will also help elevate tire pressure on one particular point. 5. I’m renting a pitch for the first time. What special requirements should I consider now that I’m travelling in a motorhome? Ask your camping site about hardstanding pitches which are ideal for heavy vehicles if the campgrounds are muddy and soft especially during winter. Be sure that your motorhome is allowed on site as certain campgrounds have temporary or permanent limits on motorhomes. 6. Which is best? Butane or propane gas? Obtained from crude oil, Butane and propane gas are both compressed into liquid form making them LPG or Liquefied Petroleum Gas. The two gases change from liquid to gas under varying temperatures. Butane changes from a liquid into gas over 0°C and contains a higher amount of energy per volume making is a better option for heating and cooking during the spring and autumn rentals. Butane will be a major let down during the winter months only because it won’t boil below 2°C. Propane will turn into gas even under -40°C making it an ideal gas for winter rentals. Butane gas is sold in blue cylinders while Propane comes in red or green barrels. 7. Why do I need two batteries in a motorhome? You have to use two batteries in your motorhome – one for leisure usage and another for automotive usage. The automotive battery is made to produce a powerful current for a short time to spark up the engine. It cannot distribute a small number of Amperes over the course of several hours and when not in use is either being charged by the motorhome alternator or rests. Generally recharged many times the leisure batteries help convey a small portion of Amperes over a more extended period. The leisure battery helps run every day motorhome utensils, and most motorhome lenders include both cells in a motorhome. Do ask the owner of your motorhome lender if they could add another leisure battery. If you’re looking for Cambridgeshire campervan hire options, we’ve got ‘em! 8. Can I run the motorhome refrigerator when on a ferry? Sadly, you cannot! Short ferry crossings (an hour or two) shouldn’t be much problem. Pack meats and other perishable items of food in ice packs or cool boxes. If your ferry journey is a long one, it’s advisable to lay off purchasing food till you reach your destination to ensure minimal food wastage and cut down on wasted savings. 9. Does my motorhome hire need seat belts for the rear seats? 10. How do I keep a motorhome rental safe on holiday? The newer the motorhome, the higher the risk of theft. To avoid costly insurance procedures, its best to fit your motorhome hire with one or two anti-theft devices like wheel locks and other immobilising devices. Ask your motorhome lender if any security devices are already installed and add a few of your own to eliminate the risk of becoming another vehicle theft statistic. Now that we’ve cleared your doubts, chose you travel dates and reseve a motorhome hire on Camperbug! If you still dont know where you’d like to start your journey perhaps our blog on the 10 trips every campervan or motorhome owners must make will help. Bon Voyage! 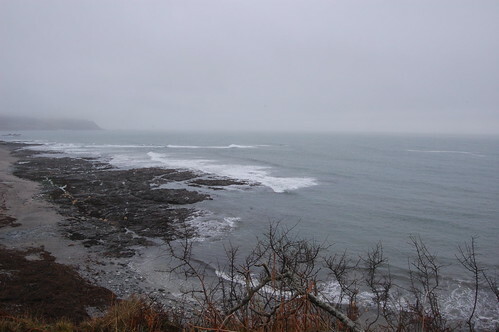 I went for a walk on the coast in East Prawle before the new year came in. It was an overcast, cold day and much of Devon had snow on the ground but this small village on the southernmost tip of the Devon coast was free from snow but wrapped in a beautiful fog. I took a route down the bridle-way from the village which lead down to the coast. 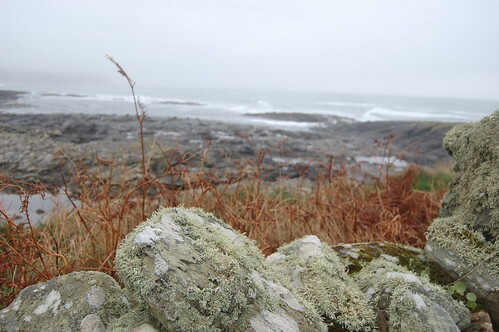 The path was rocky and wet but the views in the distance showed a sea that was shrouded in fog. The greys and blues of the landscape were beautiful and I had a lot of fun taking shots. Walking along the coast for a few miles and really enjoyed taking shots of the view. 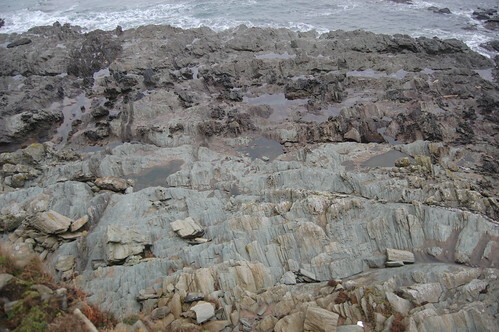 The rocks taper down to the sea and the rhythm of the waves has created striated ledges which reach out to the sea. The rock pools which have been created by the eroding actions of the sea look like great spots to farm mussels and I hope to return to this spot with a bucket for a spot of foraging very shortly! This is a really interesting and rugged part of the county. It tends to get ignored as it is a little harder to reach then the more popular and larger resorts found along the coastline but this would make a good spot for bringing the campervan for a spot of wild vanning. 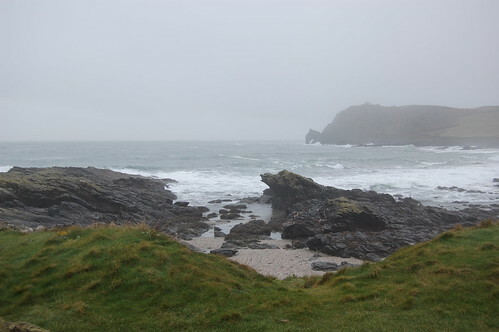 Walking along the coastline fulfills two passions which I need to indulge more in 2011. Namely walking and photography. I got really into messing around with the white balance on my camera during the walk but have only included the photos on this blog which were shot using a fairly natural white balance. I took quite a few other out there shots using iridescent settings which are interesting to look at but were a little outlandish and tended to detract from the scene. The cove below was very pretty and I’d very much like to sit down there when the tide is out and spend a few minutes looking out to sea. Going around the headline revealed a respite to the rocky shoreline and a green grassy bank emerged. 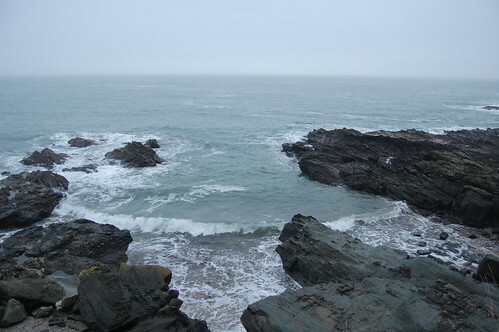 I recommend this part of the Devon coastline to anyone visiting Devon for their holidays. All along the coastline there are plenty of places where you can picnic and its relative isolation means that there are some great views of the coast line unspoilt by hoards of tourists.